According to The Hostapedia by Mark Zilis (2009), "...seedling out of the 'Cynthia', 'Aunt Saphrona', and 'The Graveyard One' breeding line (Tompkins 1991); sibling to 'Snowbound'." Introduced in 1946 by Cynthia Tompkins of Nebraska, this cultivar was registered on her behalf by Peter and Jean Ruh of Ohio in 2001. The plant grows into a large size hosta about 23 inches in height and 52 inches in width with foliage that is slightly corrugated and wavy. It has pale lavender flowers that bloom from mid-July on scapes up to 33 inches tall followed by many seed pods. An article comparing H. 'Sunny Smiles' and H. 'Shade Fanfare' by Warren I. Pollock in The Hosta Journal (1996 Vol. 27 No. 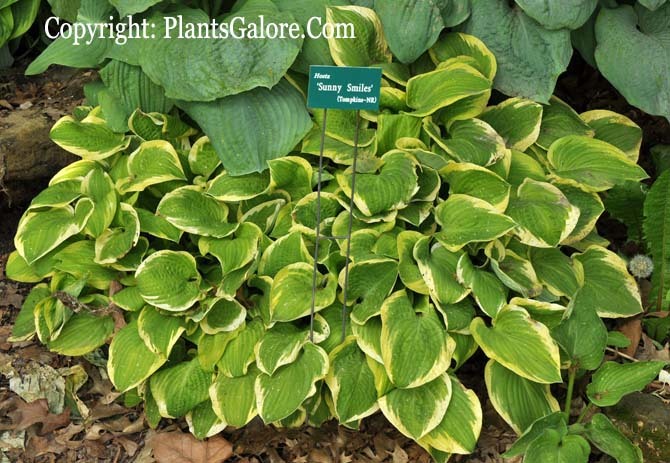 2) states that, "These hostas are very similar. The only difference I have noted is the leaves of 'Sunny Smiles' are a bit larger and brighter." Similar cultivars include H. 'Shade Fanfare'.